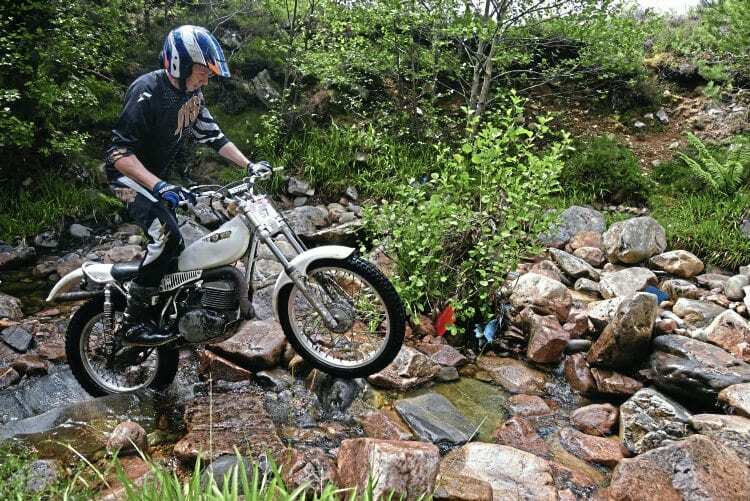 Since themeing the Highland Classic two-day trial there has been the Bultaco Edition, the Dave Thorpe Edition, the Bill Wilkinson Edition and this year was the year of the YamScot, held over June 11/12, 2016. In Edition Yamscot there was one rider on an actual Yamscot – John Stuart from Bon Accord club in Aberdeen. Devised by Les Shirlaw of the Aberdeen dealer Shirlaws to promote their Yamaha agency, the YamScot banner saw trials, MX and road racing Yamahas in action. Mick Andrews, Yamaha’s development rider in the 1970s, was invited up to ride a Yamaha in the event and had a great time. The trial has settled on two laps of a decent rideout each day with 18 sections per lap and there are streams, banks, hillclimbs and several routes through each section for various classes. There’s a generous time allowance each day and refreshments are provided at the end of each lap. The event has always been over subscribed so make sure you’re ready when the 2017 entries open online on February 1.